Kentucky dominated the boards to snap a four game losing streak with an 81-71 victory over our Tide. Alabama played hard, and really did not play that bad of a game, but they were up against a very talented, wounded animal. Kentucky simply was not going to be denied, and credit to them for finally showing a sense of urgency when they needed it most. The loss drops Alabama to 17-10, 8-6 in the SEC. Jerry Palm's bracket today has us as an 8 seed playing against Houston in Charlotte. I think we need at least one more win to feel good about getting in. We are now in a 4 way tie for 3rd in the SEC, and teams 3-11 are only separated by 2 games. It's going to be a crazy finish to see who gets the coveted double-byes in the SEC tournament. This game was lost on the backboards. We played a 2-3 zone for much of the game, and simply could not get a rebound out of it. Kentucky out rebounded us 44-27. They had an absurd 20...,TWENTY! offensive rebounds, compared to our 9. I definitely understand the reasoning behind playing so much zone. UK is not a very good shooting team, though they did end up going 4 of 11 from 3 point range and made 75% of their free throws. Still, after the second time they scored on their fourth opportunity in a single possession, it was time to switch to a soft man, or try something different. The substitution patterns continue to drive me nuts. Dan started and played 15 minutes, and somehow managed to only pick up 2 fouls in that time, but he only pulled down one rebound and scored 2 points. He was a liability against the quicker Kentucky forwards. Collin fouled out in 29 minutes and also missed some time with an injury, as it appeared he may have been bleeding. I thought he tried to do a little too much at times, and ended with 12 points, going 0 for 4 from 3 point range. On the positive side we had 4 guys in double digits. In addition to Collin, Alex Reese had a nice game with 10 points in 15 minutes including a couple of 3s. Petty finally showed some signs of life on the road with 13 points including 3 of 10 from downtown and a perfect 4 of 4 at the line. It was good to see him getting to the line, but he still struggled with turnovers and shot selection at times. Donta continued to do his thing, with 16 points, 6 rebounds, and a couple of blocks in 30 minutes. He did miss a few free throws, and he had to leave the game at one point as it appeared his injured wrist was bothering him. The team hung around and had a 1 point lead with 8 minutes left, but we appeared to play tight down the stretch and couldn't make the plays to stay in the game. This UK team may not be as good as some recent versions, but they are still plenty talented, and you're not going to walk into Rupp and win by being doubled-up on the boards while shooting 25% from the arc and 62% from the line. 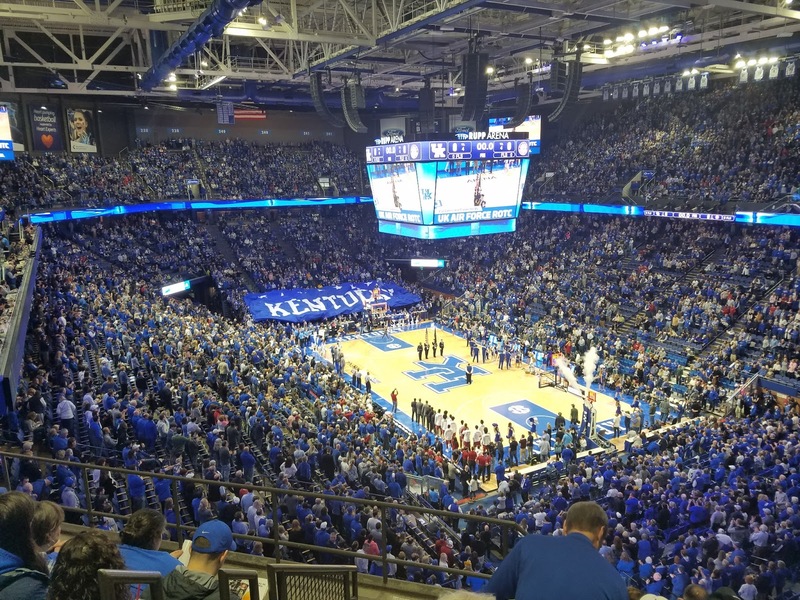 As always, the crowd and atmosphere was awesome at Rupp. It was a sellout, but there were a few empty seats in the upper level to be found, thankfully including the one next to me, so it was nice to actually have a little bit of space. They've made some improvements since my last trip there, including a nicer scoreboard/video replay screen and sound system, but the upper level seating is still very cramped. I'm told more renovations are coming to the adjoining Lexington Center, but they've been talking about that for at least 6 years now, so I'll believe it when I see it. I have to admit, I'm a little jealous of Kentucky. I would kill for Alabama basketball to have the fan support and passion of Big Blue Nation. 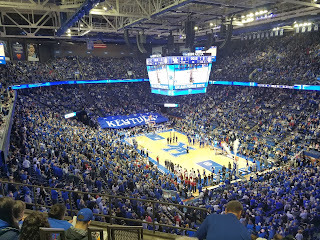 Even though they are generally down on their team this year, we had many people come up to us before the game and say some variation of "you guys are going to kill us," they still pack the place and get loud at key moments. They are also the most welcoming, classiest group of fans you will find. Not a single person said anything negative to us, and dozens went out of their way to say "welcome, we're glad you're here, etc." We had brunch before the game, and the couple sitting next to us at the bar ended up giving us their home address and invited us over to hang out after the game. The owner of the establishment introduced himself and gave us shots on the house. If you're ever in Lexington, I highly recommend Carson's, great bloody marys and the food was great! Every usher at the game, before and after, had kind words for us. There were more Alabama fans there than I've seen in the past. There was at least a little crimson in every section, so we probably had close to 500 or so total scattered throughout. Up next, it doesn't get any easier, as we travel to the ugliest village on the plains to take on conference leading auburn. The Tigers are coming off a bad loss to South Carolina, and I suspect they were looking ahead to this game. The contest is set for a 7:30 pm CT tipoff on SEC Network Wednesday night. I'm still debating whether or not to make that trip.